One Indian Army Aviation chopper on Saturday made an emergency landing at Bihpuria College playground in Lakhimpur district following a technical snag. This has been informed by Tezpur-based defence spokesperson. According to the defence spokesman, the Indian Army Aviation chopper took off from Tezpur’s Misamari on Saturday to Dibrugarh and during its journey the copter developed a technical snag in mid-air at around 2 pm. The chopper had three Army officers and one pilot on board. The distance from Bihpuria, a small town, is about 38 km from North Lakhimpur town, the district headquarters of Lakhimpur. 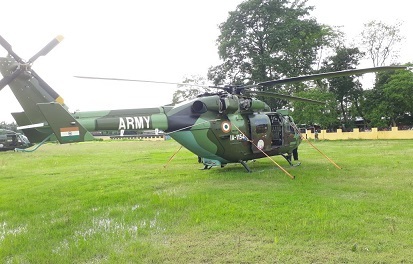 Lt. Col. Harsh Wardhan Pande, the Tezpur-based defence spokesperson informed that as the Indian Army Aviation chopper had to make emergency landing at the Bihpuria College playground due to technical snag, another chopper reached the spot with Army engineers and the other officials were taken back. He said that the repair work was going on. The chopper – IA-1154, a HAL Dhruv – was still in the playground of Bihpuria College and it would take more than one day to repair. After the incident, a huge crowd gathered in the playground to see the chopper and local police had to be deployed in the area.